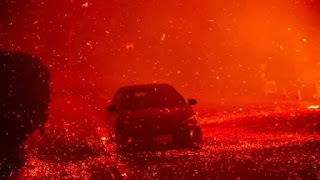 California - The fire hit southern California on Monday, December 5, 2017, local time night. Fueled by strong winds of Santa Ana, the red rooster is spreading rapidly and destroying about 26,000 hectares. Similarly, as quoted from CNN, Tuesday (5/12/2017). The fire also engulfed the settlements, causing thousands of people to flee. During the evacuation, one person was reportedly killed. The victim's car toppled when he was about to evacuate himself from a fire. Head of the Ventura County Fire Department Mark Lorenzen reported Monday evening local time. Around the residents of 7,786 homes in Ventura and Santa Paula received mandatory evacuation mandates from the local fire department, even though the fire has not reached the settlements. Evacuation is still done because the fire is rapidly creeping without obstacles can participate melalap Ventura and Santa Paula. "The fire is spreading out of control, so a number of buildings and areas in the area can be threatened," said Ventura Regional Police. Ventura District Police officers came and banged on every house, urging residents to evacuate. Latest news mentions, the fire has spread to several power stations in Santa Barbara and Ventura. As a result, power outages in the settlements with 260,000 residents. Southern California Spokesman, Susan Cox, reported. The fire disaster, collectively known as Thomas Fire, was reportedly first appeared in Steckel Park, northern Santa Paula, southern California at about 6:30 pm local time. Strong winds blowing at speeds of 64 - 96 km / h and dry vegetation in the region, making the fire spread rapidly. Within hours, the fire spread to tens of thousands of hectares, including upland areas and perimeter settlements. CNN reported, after the fire approaching, residents of Santa Paula, California in droves to evacuate from their homes. Night fires, power cuts and high winds hit the area, causing local authorities to find it difficult to deploy aircraft and fire helicopters to tame the reds from the air. "We will deploy planes and helicopters after the sky has begun to light up, so they can fly safely," said Mark Lorenzen, head of the Ventura County Fire Department. To tame fire by land, local authorities deployed about 500 firefighters. As for the evacuation point, local authorities set up two locations managed by the California Emergency Response Agency and the Federal Agency for Emergency Situations Management. 0 Response to "Terrifying Fire Struck Venture County, California, Thousands Refugees"